1From the Dashboard, choose Pages→Add New to add an image to your page. If you want to insert the image in a blog post, choose Posts→Add New. The Add New Page page (or Add New Post page) appears. 2Click the Add Media button. 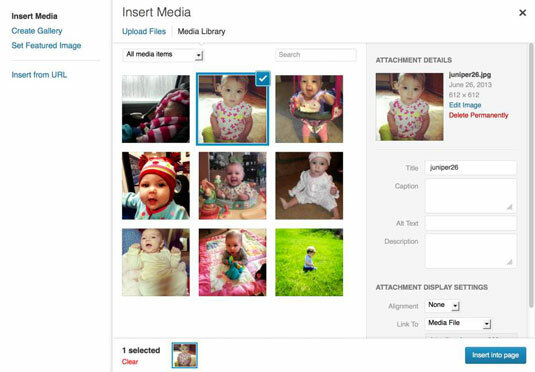 The Insert Media dialog box opens, enabling you to choose images from your hard drive or from a location on the web. 3In the Insert Media dialog box, click the Select Files button. A dialog box opens from which you can select images from your hard drive. 4Select one or more images, and then click Open. The images you select are uploaded from your computer to your web server. 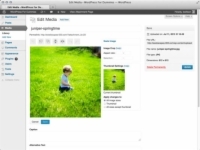 WordPress displays a progress bar during the upload and then displays the Image Options dialog box when the upload is finished. 5Edit the details of each image by clicking on the image thumbnail. A box that contains several image options appears on the right side. Title: Type a title for the image. Caption: Type a caption for the image. Alt Text: Type the alternative text for the image. Description: Type a description of the image. Alignment: Choose None, Left, Center, or Right. Link To: Type the URL you want the image linked to. Click None to prevent the image from being clickable; Media URL to let readers click through to the direct image; Attachment Page to let readers click through to the post that the image appears in; and Custom URL to let them type their own URLs in the Custom URL text box. Size: Choose Thumbnail, Medium, Large, or Full Size. 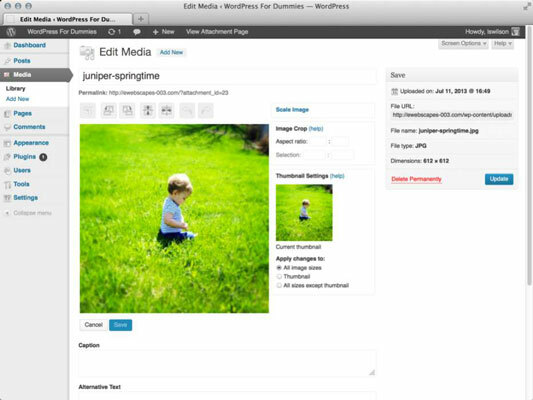 WordPress automatically creates small- and medium-size versions of the images you upload through the built-in image uploader. A thumbnail is a smaller version of the original file. You can edit the size of the thumbnail by choosing Settings→Media. 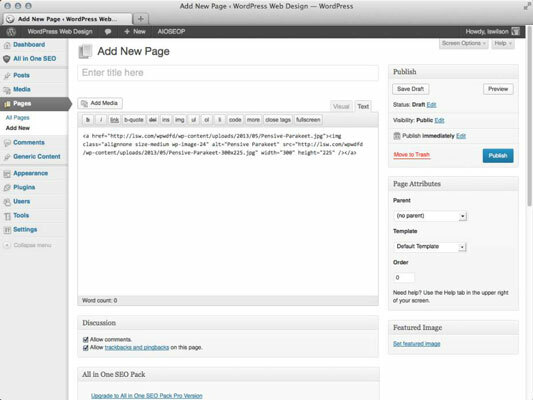 In the Image Sizes section, designate the height and width of the small and medium thumbnail images generated by WordPress. 7Click the Edit Image link (to the right of the thumbnail of the image) to edit the appearance of each image. The Edit Media page appears. 8After you set the options for the image you’ve uploaded, click the Update button to save your changes. You return to the Insert Media page. 9Click the Insert into Page button in the lower-right corner. 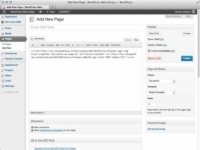 In HTML view, you can see that WordPress has inserted the HTML code to display the image(s) on your page; you can continue editing your page, save it, or publish it. To see the image and not the code, click the Visual tab that’s just above the text box.